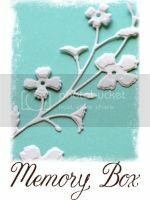 Memory Box Dies are very versatile...use them as Dave designed them to be used, or experiment and alter the diecuts for a different look. I used the Metal Adapter Plate for this project - it's great with the intricate dies, and helps cut through heavy materials like felt. Leaf Swirl 98345 was first cut as usual, then cut with Scalloped Circle 98109 as a poufy treetop. Tall Birch 98336 was cut, trimmed and limbed to create a new trunk for the treetop. Perched Reedbird 98160, a favorite from an earlier release, was cut from felt and cardstock (punch a hole for the eye) and layered so the Vanilla Bean cardstock shows up as his feet and eye. View our newest release here - you'll love the great designs!